I spent over an hour yesterday organising my 'handy', only to be told at the end that I had failed the screening procedure, probably because my bank account here hasn't been open very long - a pain, but the people in the shop were very good about it. I'll head back in a week or two to try again. After my failed attempts, I headed to a pleasant cafe and did some editing on a paper for a while before making my way back to the guest house (no flat yet, but a couple of viewings coming up). The cafe was nice, but not quite what I'm looking for in a 'local', yet. On the way back to the U-bahn I passed the entrance to the tower of St Peter's overlooking Marienplatz and with the light of the late afternoon having burnt through most of the cloud I thought it would be a good chance to see the city from above. 15 or so floors up and you come out into the fresh air and have a fantastic view of the city and the Alps in the distance. 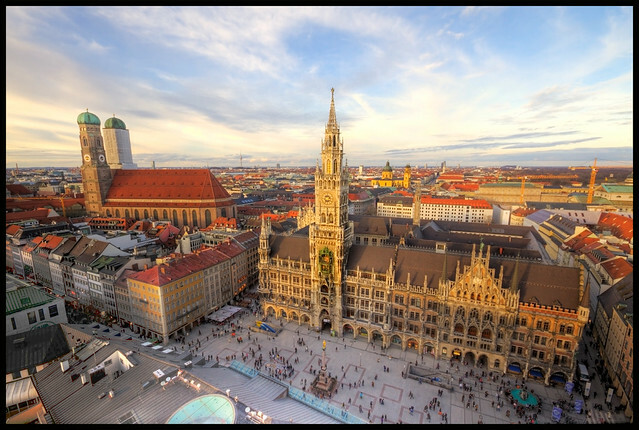 I've only had time to edit one of the photos so far, but this is of the Rathaus and Marienplatz, facing North with the FrauenkircheAddress: on the left.